CabinFever’s first evening length production, Heart Content, took place at the Stimson-Green Mansion, an iconic example of eclectic architecture which was completed in 1901 by Kirkland Cutter. Each room was designed with a specific architectural style and is completely different from the next. 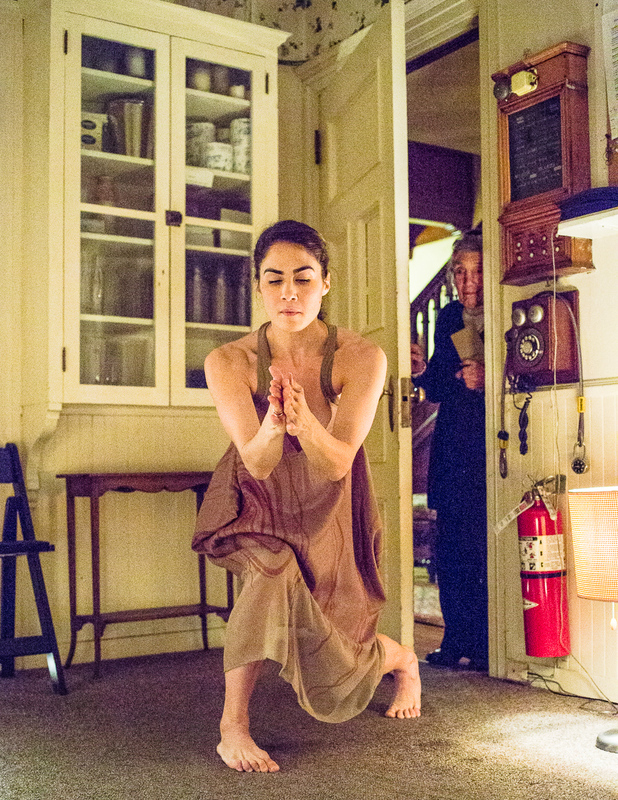 The stories of the Stimson and Green families’ activities in each room provided inspiration for choreographer and co-founder Elana Jacobs’ installations, and she managed to successfully integrate the group’s own stories with those of the mansion. Walking through this beautiful home (under the guidance of the program/map) and finding hidden treasures such as the family’s safe box, felt similar to being inside a game of Clue. But instead of solving a murder mystery, the goal was to scavenge for art. The performance began upon entering the home’s front hall. Its decorative ceiling, with highly finished exposed beams and a richly painted red and gold burlap surface, framed the three dancers (Sarah Lustbader, Dylan Ward, and Emily Sferra) as they stood at the bottom of the adjacent staircase. Clad in sheer beige dresses or shirts detailed with a heart content designed by Erik Andor, they greeted all guests, announced the house rules, and led everyone into the ballroom for drinks. After performing a circle song guided by vocalist Rebekka Goldsmith, the performers led the way out, encouraging audiences to explore the home. Ambient music made of light guitar strums, a piano, and a violin invited people into the Call Room, where Sferra evoked metaphors of flying and floating either by extending her arms wide as if soaring or kneeling and following her hands pressed together like a fish swimming through the air. 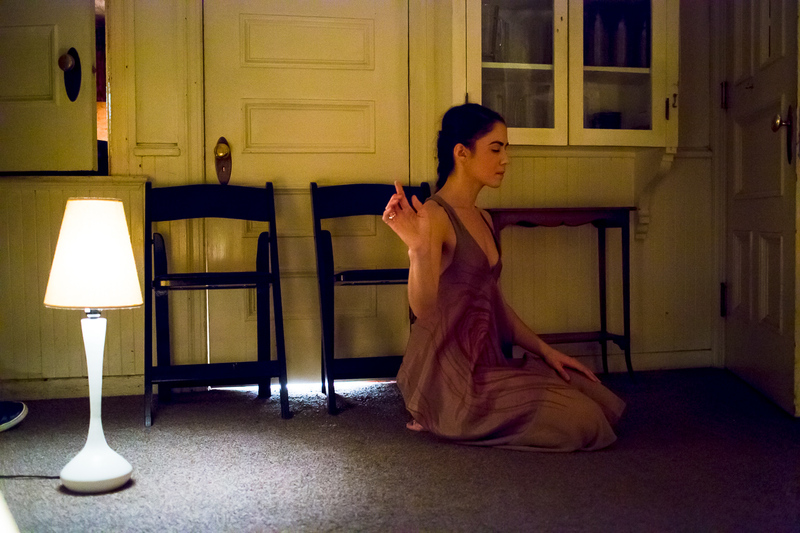 Her solo was inspired by how the servants would run to the different rooms in the mansion from this service room, pausing their own thoughts to attend to the families’ needs. In keeping with this idea, her focus often changed rapidly as if some distraction called her attention. At other moments, though, she solemnly closed her eyes and seemed to sense the space around her with her fingers. Behind the Call Room, the kitchen led to the Dining Room, whose English Renaissance style, complete with sycamore paneling, made it feel completely isolated from the rest of the home: an ideal place to keep pretenses concealed. Here, Ward accompanied his twirling, hopping, running, and arabesque balances around the dining table with text concerning situations that appeared to be something they were not. One of his stories was about a man he was dating and how he thought he had said, “Sometimes I want to kiss you in the face,” but in fact had said “Sometimes I want to hit you in the face.” The mansion story behind his solo was how Mrs. Green would often present Mr. Green with butter wrapped in a margarine label since Mr. Green liked to keep the cost of his food low. Apparently for the Green family, things were not often as they appeared. Continuing on with the theme of appearances, Lustbader danced in the Bedroom on the top floor accompanied by Mike Rimoin’s ukulele. She continually changed her outfit and hair, adding and subtracting socks and a sweater between movement phrases. What started as a slow, clear demonstration of lines and circular patterns carved in the air with her finger, arm or torso evolved into an energetic sprint through the choreography to keep up with the music. Finally exhausted, she lay on a king size bed and spoke about constantly having to remind herself to live in the present moment. The inspiration behind changing her appearance and keeping up with time came from Mr. Cutter himself. Concerned with his baldness, he had three wigs of differing lengths to keep up with the passage of time. The text integration at the end was a fantastic example of the mingling of performers’ stories and the mansion’s stories. The home abounded with music that invited guests to every nook. In the top floor’s Bathroom, Anna Goren looped her own soft voice with sounds made by drumming on the bathtub and sink. The Tea Room’s Neoclassical architecture fit perfectly with the deep vocalizations and playful high-tones improvised a cappella by the singers. Doug Barber’s acoustic guitar melodies resonated through the Basement as he sang about birds, scorpions, and other animals. Throughout the installations, Jacobs shows her gift for presenting and diving into awkward moments from daily life, extracting the beauty in them, and finding joy in these slight discomforts. This is especially clear in the final performance in the Ballroom. Dancing with heavy tap and silly hops at random to piano, guitar, and singing by all the musicians, Lustbader, Sferra, and Ward used house-sitting instructions as a metaphor for how they care for their particular bodies’ needs. The motif of appearances also reappeared in a game where Lustbader and Sferra guessed each others’ mimed words. From ‘olive juice’ to ‘elephant shoes’ to ‘I love you,’ both performers expressed their vulnerability throughout. The performers’ willingness to stay present, look people in the eye, and share the mansion’s stories along with their own made for an evening full of whimsical charm. Heart Content will have another showing November 15 at 7:30 PM and November 18 at 4:30 PM. While all performances are sold out, it might be possible to get on the waitlist by emailing CabinFever. More information is available on their website. Heart Content was made possible by 4Culture’s Site Specific program.